The fall of 2004 found me driving across Texas and in to the mountains north of Denver to take a gap year from school. The allure of the hiking and camping in the mountains was strong and I had to go. While I was there, I would be attending be attending a Bible School called Ravencrest Chalet, nestled high in the valley just outside Estes Park, CO.
One of the first orders of business when I arrived was to find a suitable coffee shop. Sure there was a Starbucks in town, but there's a Starbucks in every town. I took a tip from one of the instructors at school and headed to Kind Coffee. I was not disappointed. the creek in the background. Spots by that creek became my favorite for reading on a nice day. The staff at Kind Coffee was always welcoming and happy to see you and would often pass the afternoon wrapped in conversation. When I wasn't reading, I would find myself at the counter for hours. 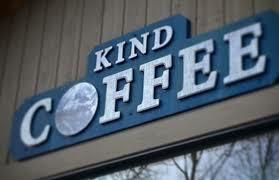 Kind Coffee specializes in Fair Trade and organic coffee, and also environmental sustainability. When they are not pouring cups of coffee inside of their store, the folks at Kind Coffee are out in the community, giving back with their time and resources. They even have an in-kind giving program called K(in)d! When I moved away from Estes Park, Kind Coffee was one of the many places I was sad to leave. I've followed along their journey through social media and have have been please to see all of their updates with improvements to the store and have been meaning to get my hands on a Kind Coffee hat! Hopefully someday I can pack up the family and take a trip back to Estes Park and make a stop by Kind Coffee to see how the old place is doing.